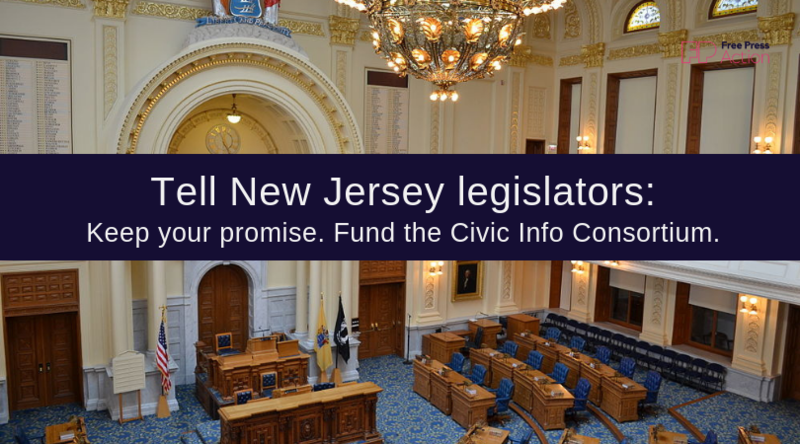 The New Jersey legislature promised $5 million to the Civic Info Bill — and the consortium it created — in New Jersey’s 2019 budget. Now it appears the money that was earmarked for this historic initiative isn’t available. New Jerseyans have worked tirelessly for two years to pass the Civic Info Bill and get the local news our communities need to be informed and engaged. Without proper funding, the consortium has little chance of succeeding. Bills S‐2987 and A‐4456 will fix this oversight and provide the consortium with the $5 million it needs to launch and realize its transformative vision of local news coverage that serves all New Jersey residents. Pass S‐2987/A‐4456 and give the Civic Info Consortium the funds it needs to succeed. After New Jersey residents like you reached out to lawmakers and Gov. Phil Murphy calling on them to fully fund the Civic Info Consortium, the possibility of securing millions to invest in local news and keep communities informed and engaged is back on the table. Gov. Phil Murphy recently told listeners of WBGO’s bimonthly “Ask the Governor” show that signing the Civic Info Bill was “a no-brainer” and he’s “committed to try to figure out not just how to establish this in law…but also to put resources behind it that allow it to do the work it’s intended to." That same day, Senate Majority Leader Loretta Weinberg and Assembly Majority Leader Lou Greenwald introduced a bill to put $5 million into the Consortium, a crucial first step toward fixing the budget mix‐up that left the first‐of‐its‐kind nonprofit unfunded. Sen. Weinberg and Asm. Greenwald have championed the Civic Info Bill — and the consortium it created — from the start. And they need our support again to show lawmakers in Trenton that the public is on their side when it comes to investing in local news. Pushing the Civic Info Bill over the finish line in August was a hard-fought and historic victory. We’ve already done the impossible — now it’s time to get the consortium the funding it needs. The first step is to get the lawmakers who are in charge of the budget process on board. We have to keep up the pressure. Sign the petition today to urge legislative leaders to dedicate the money the consortium needs to succeed. Picture courtesy of Wikimedia user Niagara.